Why use flashcards or worksheets to practice basic facts when you can use a game instead? 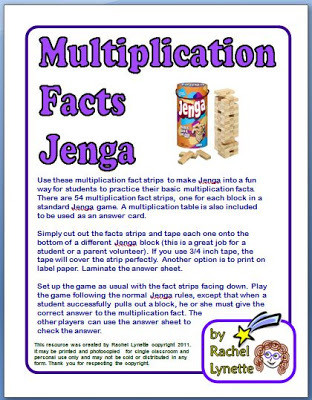 You can use these free fact strips to make Jenga into a game students will love to play again and again. 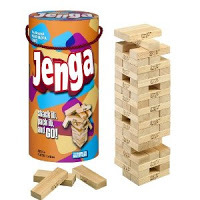 If you don’t have a class Jenga set already, you can probably find one for a dollar or two at a thrift store. The game requires a little prep since you must cut the strips and tape them to the Jenga blocks (but this would also be a swell job for a parent volunteer). But once the game is ready, it can be played all year long. 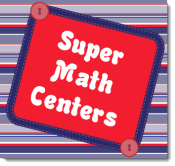 Perfect for any math center! You can also get a fun Get-to-Know you Jenga game for free right here! Find more great Math Center ideas at Laura Candler’s Corkboard Connections! Fun Ways to Practice Multiplication Expand the Use of Your File Folder Games! BOOM! A Free Game to Use with Task Cards! Writing in Math Class? 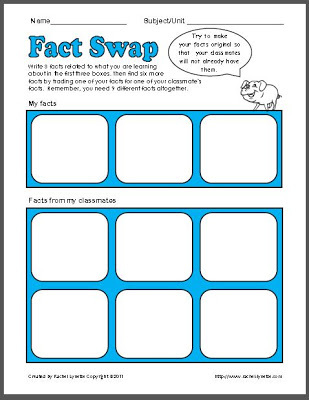 Fact Swap Freebie! 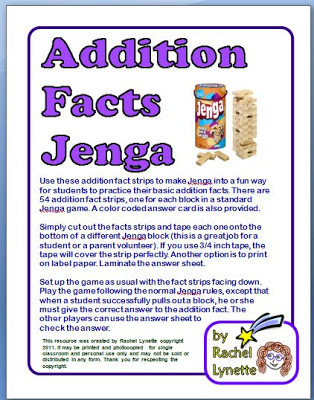 Thanks Rachel—can't wait to use this game in my math stations. Love this idea! I just numbered my blocks and put the questions on separate laminated sheets, that way I put the sheet of the skills I want them to focus on that day! Do you have division labels?